Lizzy Oke...: Therapy Update: I'm Back in Therapy!!! Therapy Update: I'm Back in Therapy!!! Well, if the title of this post hasn't already given away what I want to say, I'd like to say it Boldly!!! 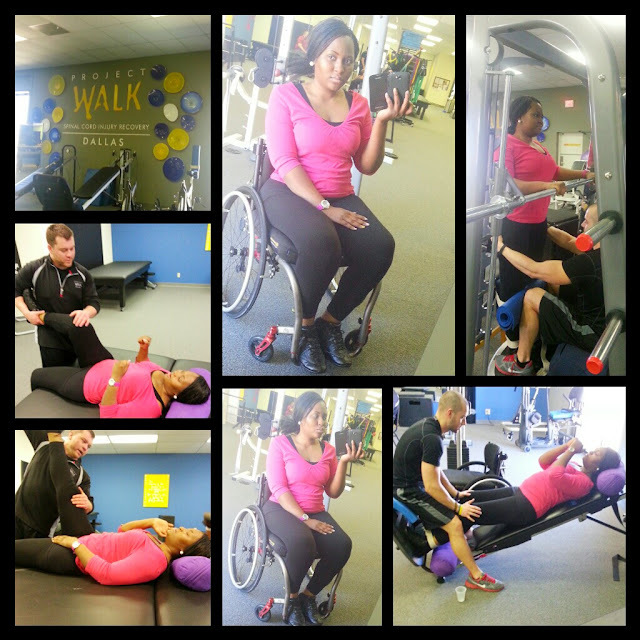 I am Now BACK FOR PHYSICAL THERAPY at Project Walk Dallas!!!! I want to say a BIG THANK YOU to everyone of you that donated in my Therapy funds to help me go back to therapy. When I decided to start the fund raiser, I honestly didn't know what would happen. I Took a step of faith after praying and after so many people suggested I start the fund raiser. I am still so amazed at how many people donated and shared the page with their friends! I truthfully can't thank you enough!!! May the Almighty God Bless you all Abundantly, and I pray that whenever you need help, God will send you an helper Immediately! I decided to start therapy before I reached the goal I set on the fund raising because I was ready to get things started. I am mentally ready for this, and I pray that the Lord God Almighty in his infinite mercies will crown my effort with success. The GOAL is to WALK Again, and I am keying in my faith and putting in all my physical effort to achieve this goal. Here's a photo collage I made from my day at therapy Today. The pictures obviously don't show you all that I did in 2 hours, but I Hope it's good enough. I'll try my best to Document my progress and I'll keep on updating you via THIS blog. As I type this, I am still in awe of how far God has brought me and once again, I truly truly pray that he crowns my effort with success. The Fund Raiser Page is still LIVE and I will leave it Going at least until the Goal is reached. So if you still want to donate, Please Go ahead and DONATE HERE. Even after the goal has been reached, Please do not hesitate to donate. I hope that I won't need the Two Months of therapy because God is able to do above and beyond, but I'd like to have enough money should I need to do more than two months of therapy. Anyhoo.... I am all smiles despite the pain I feel in my body from my first day. This is truly an amazing journey that I'm glad I have the opportunity to embark on. AGAIN, I SAY GOD BLESS YOU ALL SO VERY VERY MUCH!!! !